Regional Information Center "CARPATHIANS" » MARBLE AND DOLOMITE OUTCROP. Cathedral and Bishop’s Residence of the Mukachevo Greek Catholic Eparchy. UZHANSKYI NATIONAL NATURE PARK. ADJOINING MOUNTAIN PEAKS. GEOLOGICAL LANDMARKS OF UKRAINE. TRANS-CARPATHIAN REGION. 47° 55′ 08″ N lat; 24° 12′ 54″ E long. In the upper reaches of Biliy Stream (left branch of Tysa River) on its left bank in impressive area there are located two quarries. 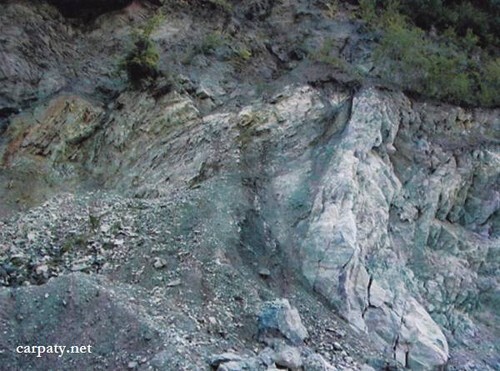 In the lower (north-eastern) quarry within carbonaceous-chlorite-sericite mafic schists of Vendian — Lower Cambrian Berlebaska Suite there are exposed white and light-grey marbles. 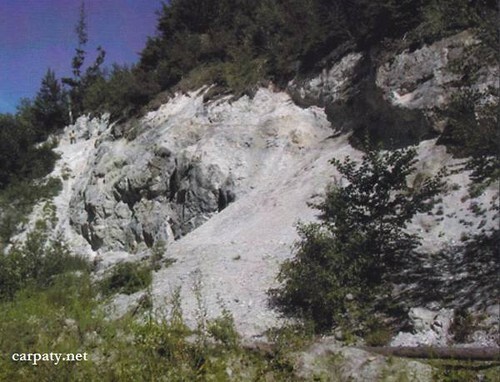 In the upper (south-western) quarry there used to mine Upper Devonian — Lower Carboniferous breccia dolomites (lower portion of Kuzynska Suite) which occur in the phillite pile. This pile rock age was determined by micro-phitofossils 3-4 km to the south in Romania. The outcrop is typical for the carbonate parts of Berlebashska and Kusynska Suites and it has significant scientific value. Accessible by motor-car — 3.5 km to the east from Dilove village centre. Legally the object as geological landmark is not defined yet. It is suggested to give the status of geological state-rank landmark. Sourсe: Geological Landmarks of Ukraine: In 3 volumes/V.P. Bezvynniy, S.V. Biletski, O.B. Bobrovetal. ; V.l. Kalinin, D.S. Gurskiy, I.V. Antakova, Eds. — K.: DIA, 2006. — Volume I. — 320 p.